Baroque dance is distinctively rhythmic, with a gentle rising and falling movement in each bar of music. It is danced lightly on the balls of the feet, with the heels only just off the floor and the feet turned out slightly, and each step sequence is accompanied by low, rounded arm movements, in opposition to the movements of the legs. Some dances involve complex and quick footwork, in a series of low springs and hops. Others are slow and stately. A focal point of all baroque dances is the intricate serpentine patterns that the dancers trace as they move across the floor. These show the symmetry, order and harmony found everywhere in 18th century art forms. You can see some of these beautiful curving patterns in the plates from The Art of Dancing, first published in 1735. "The minuet is allowed by the dancing-masters themselves to be perfection of all dancing. I once heard an eminent dancing-master say that the minuet had been the study of his whole life..."
The minuet was the most fashionable dance in the late 18th century ballroom. It was danced in the baroque or 'noble' style, which developed initially at the court of Louis XIV and was introduced to Britain by Charles II. Most baroque music was dance music, and so terms such as minuet, sarabande, gigue, bourrée and gavotte refer both to a type of baroque music, and to the dances that were performed to them. The 'noble' style was danced both socially, by ladies and gentlemen in the ballroom, and professionally, by actors and dancers in the theatre. "Do you mind your dancing while your dancing master is with you? As you will be often under the necessity of dancing a minuet, I would have you dance it very well. Remember that the graceful motion of the arms, the giving of your hand, and the putting off and putting on of your hat genteelly, are the material parts of a gentleman's dancing." An 18th century ball began with the formal dances, but later in the evening everyone let their hair down with the contradanses (country dances). These were simple and lively, and had a reputation for being danced with careless abandon and even amorousness! If the formal dances were your chance to show off your dancing skills, the country dances were your chance to socialise. Instead of being choreographed for a fixed number of dancers, the country dances were generally for 'as many as will'. Fashionable new minuets were constantly being created, but the country dances were usually old favourites that everyone knew. "Country dances... to run the gauntlet thro' a string of amorous palming puppies! ...the action of their pulse beats to the lascivious movements of the jig - their quivering, warm breasted sighs impregnate the very air - the atmosphere becomes electrical to love, and each amorous spark darts thro' every link of chain." Our knowledge of baroque dance comes largely from treatises and manuals written by 18th century dancing masters. 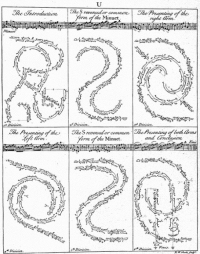 Raoul Auger Feuillet's book Chorégraphie, published in 1700, contained a system of dance notation for recording choreography. The convention was that each line of music was printed on the top of a new page, with the steps and pattern to be danced to it given underneath. Many dancing masters used this notation to record their creations. Others wrote instruction manuals, such as Pierre Rameau's Le Maître à Danser (1725), which contained detailed descriptions of each step alongside helpful illustrations and notes on etiquette. Kellom Tomlinson's manual The Art of Dancing (1735) combines Feuillet's method of notation with charming illustrations of a couple performing a minuet.